Donna Neff of Denison is retired after thirty-nine years as a hairdresser. She loves to cook, sew and tend her garden. She cooks regularly for the First Baptist Church in Denison. 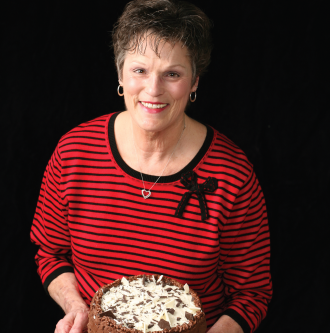 She said her signature chocolate cake is based on a family recipe that she modified over the years until it was what she wanted. Heat oven to 350 degrees. Grease and flour three 9-inch cake pans. In a small pan over low to medium heat, melt chocolate, stirring often. Remove from heat and set aside to cool. In a large bowl, beat butter and sugar with an electric mixer on medium-low setting until light and fluffy. Add eggs, one at a time, mixing well after each addition. Mix in vanilla and cooled chocolate. In a medium bowl, combine cake flour, cocoa, baking soda, baking powder, and salt. Sift twice. Gradually add flour mixture to butter mixture, alternating with milk, beginning and ending with flour mixture. Stir in sour cream and combine well. Divide batter evenly into prepared pans and bake for 25-28 minutes or until a wooden toothpick inserted into the center comes out clean. Let cool in pans for 10 minutes. Remove from pans and continue cooling on wire racks. In a small pan over low to medium heat, melt chocolate, stirring often. Set aside to cool. In a medium bowl, mix butter until creamy. Gradually add melted chocolate and confectioners’ sugar. Add vanilla and enough whipping cream to make filling spreadable. Use between layers, saving enough to frost the top. Melt chocolate, as above, and set aside. In a medium mixer bowl, mix butter at medium speed until creamy. Mix in chocolate and cream until smooth. Gradually mix in sugar until smooth. Mix in vanilla. Frosting is done when creamy. Now, just ice your cake! When Jason and Daresa Sofey purchased the former W.S. Dorset family estate on Sherman’s North Preston Drive, they were committed to bringing the 1939 residence back to its former glory, and then some, but the project would have to be a rehabilitation, rather than a restoration. Right after my eighth birthday in January, I began to long secretly for a bicycle. I watched with envy as the older kids whizzed about the neighborhood on their brightly colored beauties, with names emblazoned on the fork—Schwinn, Roadmaster, Raleigh. They were like thoroughbred horses, sleek and fast and beautiful.